Parade Square, as we saw in the previous issue, stands more or less in the middle of the Fort. Radiating from it are streets in all directions. It must not be forgotten that the Fort was once very much a town with its residents. And these needed houses, all of which were placed along the various streets that crisscrossed the entire precinct of White Town, as the Fort was known. Interestingly, as H.D. Love points out, the residents of Madras referred to the Fort as the City and to what lay outside of it as Town. The East India Company reversed the nomenclature – according to it, Madras was the city and the Fort was the town! It was Elihu Yale who, as Governor in 1688, decreed that the streets of Fort St George be given names. These names have survived till today. Thus, three streets emanate from Parade Square and the Assembly in the southern direction, these being St Thomas’ Street, which is at the eastern end of the Fort, James Street, which lies behind it, St Mary’s Church connecting the two, and Charles Street which lies at the rear. St George’s Street radiates in a westerly direction from Parade Square and eventually connects with St. George’s Gate, the principal entrance to the Fort on the western side. Three streets link the Parade Square and the Assembly to the northern end of the Fort. The easternmost, corresponding to St. Thomas’ Street on the southern side, is Gloucester Alley. Behind it is York Street, which is also known as the Middle Gate or North Gate Street as it connects to the North Gate of the Fort. To the rear of this is Choultry Gate Street, which once led to the Choultry Courts that were just outside the Fort. This entrance is now blocked. At the extreme western end of the Fort is a thoroughfare that runs south to north. This is known as Palace Street and it has an interesting history of its own, of which more later. Charles Street must have been an important thoroughfare, for it houses some very stately buildings. The most striking, and indeed the best-maintained building in the whole Fort today, is the headquarters of the Archaeological Survey of India. It goes by the names of Clive House and Admiralty House. The residence dates to the 18th Century, a time when, apart from the British, some Portuguese, Armenians and Indians also owned property within the Fort. One among these was Coja Nazar Jan, a rich Armenian who settled in Madras in 1702. It was he who built this residence and, on his death in 1740, it passed on to Coja Sultan David and from him to his son, Aga Shawmier Sultan. It was during David’s time that the residence first began to be called the Great House. 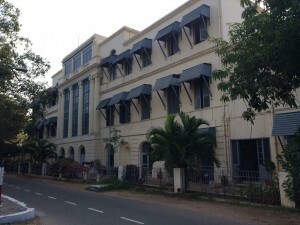 Several covetous eyes were cast on the building and when in 1749 the British moved back to the Fort after the French had vacated it, this became the residence of Richard Prince, the Deputy Governor of Madras – he was the administrative head till 1752 when the Governor officially moved his headquarters back to Madras from Fort St David in Cuddalore. The house was restored to Shawmier who then let it out to its most important occupant – Robert Clive. Among the few marble plaques that commemorate heritage structures in Madras, one is to be found on this building. It reads that “Robert 1st Lord Clive lived in this building in the year 1753. Truly great in arms and in council, he founded an Empire.” By then Clive was no longer a depressed writer or lowly clerk. He had emerged as the hero of the sieges of Arcot and Trichinopoly and was now back in the Fort as its Steward. Moreover, he was in love with Margaret, the sister of his close friend Edmund Maskylene. She arrived in Madras in 1753 and Clive, ever the determined soul, doggedly wooed her till she consented. The wedding was conducted on February 18, 1753 in St Mary’s Church in the Fort, the Rev Fabricius, who did much for Tamil and for printing in India, officiating. Clive’s married life was one of bliss and he lived the first year of it at the ‘Great House’. But he was in ill-health and had applied for home leave. This was granted in 1753 and he left for England where he fought battles of a political nature before returning once again to India, this time to conquer Bengal. His second tenure had very little to do with Madras. After Clive’s departure, Shawmier sold the house to de Castro, a Portuguese, who in turn sold it to the Company for 6,000 pagodas. It became the guest house for accommodating important visitors and it was in that capacity that it hosted Admiral Charles Watson, who in 1754 sailed from England with a large squadron fitted exclusively for the protection of the “possessions in the East Indies”. He appears to have stayed here for just a year. In 1755, the building was assigned to the then recently set up Court of Admiralty to try naval mutineers. The name Admiralty House stuck, though the court vacated the premises by 1762 when it once again became a guest house. That year the Company supplied at its expense “Furniture, Cotts, Linen and all other necessarys for the reception and Accommodation of Strangers”, a housekeeper being appointed to take care of the establishment. By the late 1700s, Admiralty House became the Governor’s residence in the Fort. With Robert’s son, Edward, the second Lord Clive preferring to live outside the Fort when he was Governor, the ‘Great House’ served briefly as the Banqueting Hall. With a new building being erected in 1802 for that purpose on Mount Road (the present day Rajaji Hall), the ‘Great House’ became the office of the Accountant General, in which capacity it was used till the mid-20th Century when the ASI took it over. An interesting aside is that the East India Company consistently defaulted on the rent to Shawmier between 1749 and 1752, the arrear amounting to 1,866 pagodas. He appealed repeatedly and it was only in 1773 that Governor Alexander Wynch forwarded his request to the Court of Directors in England. There his prayer bore fruit with compensation being paid in 1775. Landlord travails evidently have a long history in Madras! The write-up does not mention it but one of the exquisite features of this building is a staircase that rises from the ground floor to the top-most storey. In recent years, the ASI has created a ‘Clive’s Corner’ in one part of this building. This has a reasonably aesthetic display of various portraits and copies of documents pertaining to Robert Clive’s life. It is clear that, no matter who the occupants of the building before and after him were, it was he who gave it its place in history.